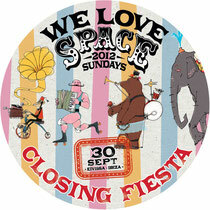 We Love… have held their tune all season with a gradual escalation to something of a top September and Closing Fiesta. The infamous We Love… closing party has become the gateway of new sounds to Ibiza over the last few years, and this year on 30th September Modeselektor, Shackleton and Mambotur step up to the stage. Modeselektor’s in-arguable grooves seem to emanate from every conceivable musical genre, creating a controlled chaos whose sonic expression elevates the eyebrows and heartbeats of critics and dance floors around the world. Associated with dancehall, techno, hip-hop and rap, they’ve completely reinvented each sound according to their own standards and blasting it out in an audio, visual and sensory overload in their live shows. With a combination of intricate, snaking percussion, hypnotic melodies, seriously deep basslines and dubwise sensibilities, Shackleton has become one of the scene’s most highly-rated producers. With a sound that bore little resemblance to anything else around, he quickly formed an evangelical fanbase stretching outside the restrictions of the club scene and into the wider world. Mambotur is the live Latin project from Pier Bucci along with a vocalist and percussionist from Argentina who play alongside him. The performance is destined to deliver a fusion of electronic sounds and Latin American music, which aurally demonstrates the trajectory and evolution of this South American duo in the last decade.